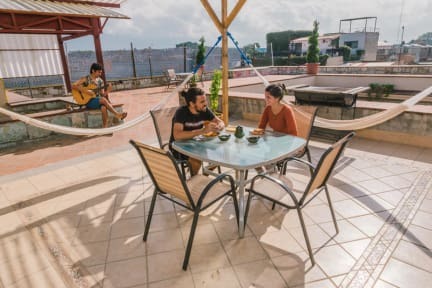 Hostal Chocolate is a friendly and stylish hostel set in an old house but with new facilities, ideal for all types of backpackers looking for a magnificent stay with excellent service. We serve a continental breakfast with Oaxaceño specialities on Sunday. There is a 24-hour front desk and the hostel is located in the heart of Oaxaca. As we are located in the centre of the city of Oaxaca, the hostel is surrounded by some museums and you will enjoy a variety of finest restaurants and bars. Yet the hostel is located on a quiet street which ensures a good night sleep. Hostal Chocolate offers spacious, modern and comfortable rooms. All rooms have private bathroom and toilet. The beds have comfy mattresses perfect for a relaxing stay in Oaxaca. Every bed has their own bed light and socket. A super cozy, brand new hostel with comfy beds😊 But Ivette and Diana really made our trip to Oaxaxa memorable though their kindness and willingness to help! We would definately reccommend this place! Hopefully we'll be back in the future..